If you're inviting your friends over to your back garden for a barbecue this summer, you'll want it to look its best. 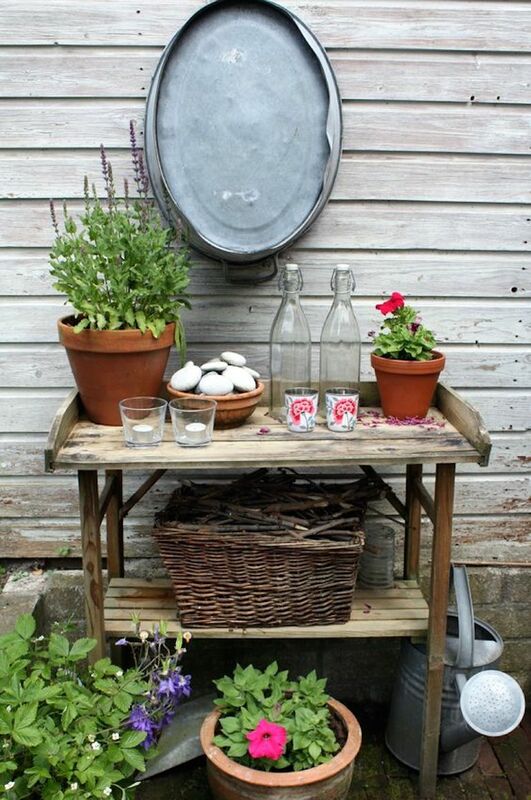 Garden accessories are a good way to pep up your garden. Whether you don't have time to go for a full re-landscaping, or if you just want to add a little something extra, these great homemade garden accessories will have your yard looking tip-top in no time. Best of all, they cost just pennies to make. These lovelies are perfect for lighting a path to your back door, or for placing on outdoor tables as a centrepiece. You'll need a large plastic container for the outside mould, and a smaller container like a yoghurt pot for the inner one. Start by cleaning your moulds and spray the inside with vegetable oil: this will help to remove the concrete once it's set. Mix your cement according to the directions, then pour the cement into the large moulds. Put the yoghurt pots inside - these will form the holes for the candles. Keep them weighed down with a few rocks, and tap the outer mould a few times to help bubbles rise to the surface. Twist the yoghurt pot five minutes before the cement sets, and pop the holder out of the large mould a couple of minutes before it has set fully. Let them sit overnight before adding a lick of paint. If you're wondering how to save money and still have a breathtaking water feature, wonder no more. For this project, you'll need a large plastic bucket, a submersible fountain pump, a square of steel mesh, some plastic tubing, a large ceramic pot and a smaller ceramic pot - you'll probably need to hit the DIY shop. If you're budgeting, it's a good idea to use our free money management software to keep on top of what you're spending. Dig a hole in the ground for your bucket, and put it in so that the rim rests at ground level. Cut a hole in the middle of your mesh square. Attach the plastic tubing to the water pump, then push it through the hole in the mesh. Put the mesh square over the bucket, and pull the pump's power cord out through the hole too. Make a drainage hole in the bottom of your larger ceramic pot and thread the tubing through. Gently rest the large pot on top of the steel mesh, and thread the remainder of the tubing through the smaller pot and perch it on top of the larger one. Fill it up with water, turn the pump on, and voila. Wind ornaments add colour to your garden, and they're easy to make at home. All you need is some fishing line, some beads, and a base (an old plate, a colander, or a block of wood work well: drill plenty of holes around the edges to attach your chimes). Thread them onto a piece of fishing line and tie a knot underneath each ‘bead' to keep them evenly spaced out. Tie the finished strings through your base, add a hook to the base, and hang it from a tree.